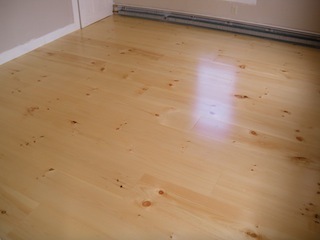 White pine flooring a knotty, soft, porous, light color and inexpensive wood species. Found in new and old homes, commonly used in traditional interior design with polyurethane finishes. 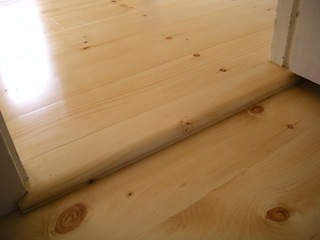 Now how has made ways into more modern interior styles, with lime washing and hard wax oil finishing techniques. Achieving a rustic, modern look without breaking the bank with this wood specie. 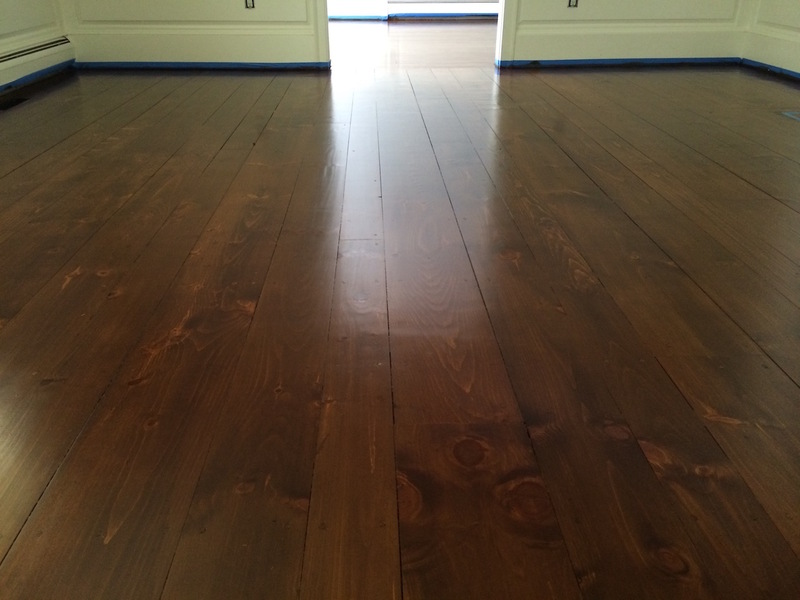 Learn how to install these tongue and groove, wide plank flooring and get some finishing tips to give your old pine wood flooring a modern touch. After you've prepared your sub-floor and had laid out your vapor barrier. 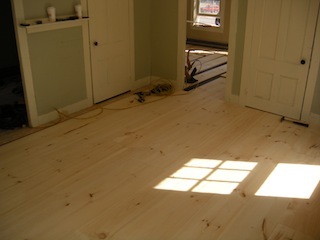 Begin with a layout of your wide plank pine flooring. 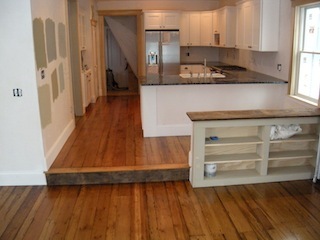 Move the flooring boards around until, you get your desired look. Pre-cut your oversized end pieces for each row. 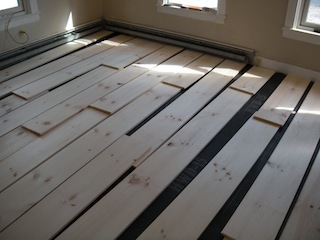 Then cut the flooring boards to fit as you install them. 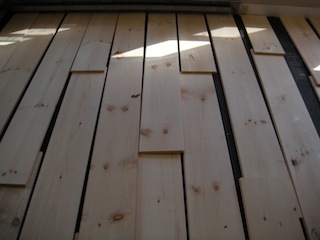 These pine flooring are stapled down, then faced nailed. The faced nails are nailed 6-8" apart, into the knotted areas, to keep them hidden. Carefully place nails in areas that will be less noticable. 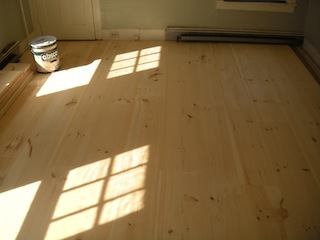 With the hardwood floor installation complete, the pine flooring is now, ready for sanding and finishing. 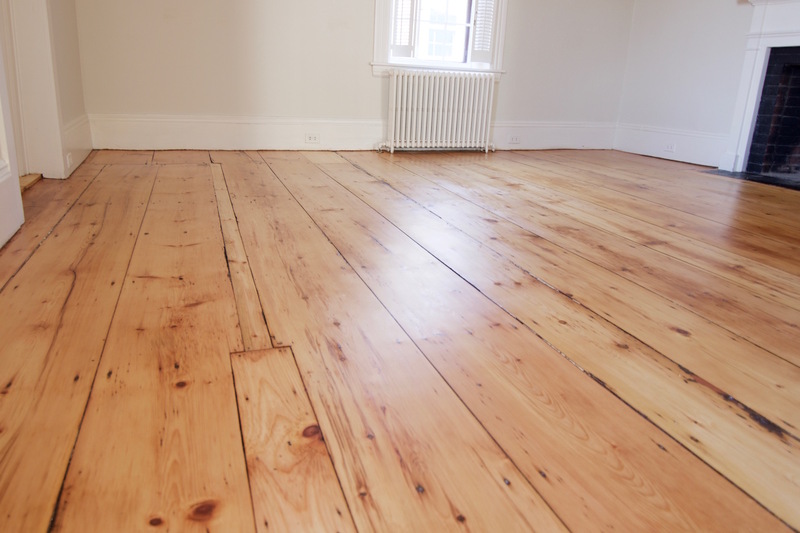 The home owner's previous wood floors were damaged, from rot and from the house settling over the years. 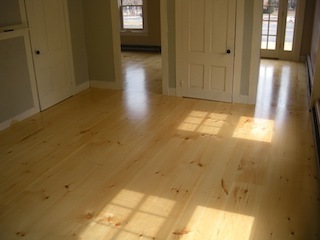 They chose white pine to maintain the old charm of the house. Always, start from your longest wall to keep your floors parallel to your walls and straight throughout your home. 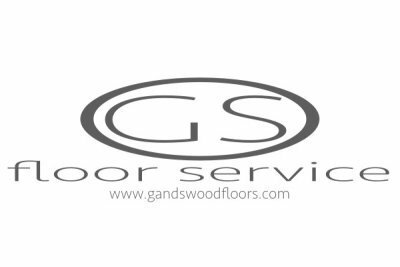 When making a transition to a different flooring material. 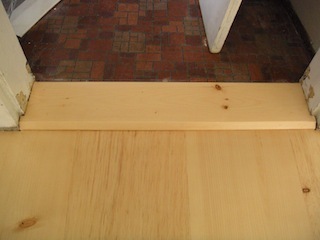 Install a divider, like this one, to keep the surfaces at the same height. Keep the width the same as the door casing. A matching pine flooring threshold was made for this doorway. You can make one by just beveling both sides at a 45 degree angle, leaving a 1/4" reveal at the base. Use a reducer to go from one level to another. Hand planing the front edge into a curve, then finishing it off with a sander. 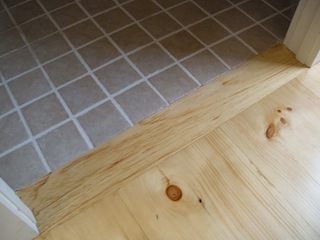 The slightly rounded edge will hold more wood floor finish. 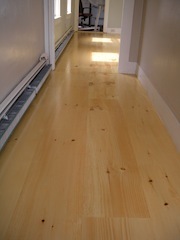 After sanding and applying three coats of oil-base Satin polyurethane, these floors are ready for move-in and foot traffic. Stain layering with the combination of aniline dyes and wood stains will give you a unqiue look with highlights and vibrant colors. 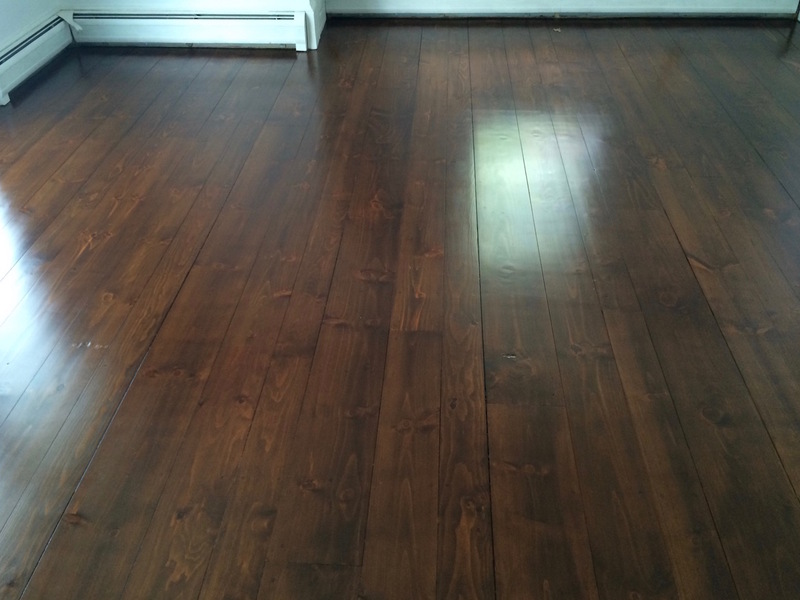 For deep dark tones that a regular wood stain can't give you, add a layer of aniline dye. 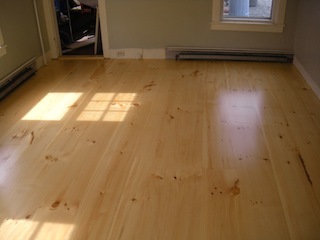 Adding a medium stain such as Provincial will enhance the look of your pine floors.